1. Highland Street Foundation Free Fun Fridays with free admission to 10 attractions across Massachusetts every Friday for 10 Fridays this summer! Fridays from June 29, 2018 to August 31, 2018. 2. Free Outdoor Movies in Boston with Free Friday Flicks at the DCR Hatch Shell on the Esplanade on Friday nights this summer starting at dusk. Fridays from June 22, 2018 to August 24, 2018, no movie July 6. 3. Magic Family Film Festival at the Prudential Center Courtyard on Saturday nights at dusk this summer. Saturday nights from July 7, 2018 to August 25, 2018. 4. Free Movie Nights at Christopher Columbus Park on Sunday nights this summer. Sunday nights from July 22, 2018 to August 26, 2018. 5. Head to Assembly Row in Somerville for Sylvester Baxter Riverfront Park Movie Series on Saturdays at dusk this summer. July 7, 2018 to August 25, 2018. 6. Mayor Walsh’s Free Movie Nights in various Boston Neighborhoods on various nights. August 2, 2018 to August 30, 2018. 7. 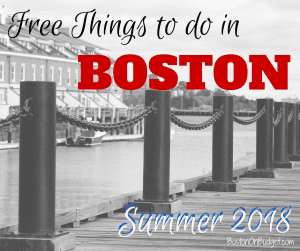 Boston Harbor Hotel’s Summer in the City Series with free music on Tuesday, Wednesday and Thursday nights this summer and free moonlight movies on Friday nights this summer. June 7, 2018 to August 28, 2018. 8. Free Boston Calling Block Party every Thursday evening from 5-8pm at Dewey Square. Every Thursday night until August 28, 2018. 9. Berklee’s Summer in the City Series with over 200 free music performances all over the city. Now through end of September, 2018. 11. Midday Music at Post Office Square with free music on Tuesdays and Thursdays from 12-2pm. Now through the end of August. 12. Free Summer Concert Series Harborwalk Sounds at the ICA on Thursday nights from 6-8:30pm. (Reminder: ICA admission is also free on Thursday nights). Thursday nights from July 5-August 30, 2018. 13. Free Landmarks Orchestra Classical Concert at the Hatch Shell on Wednesday nights from 7-9pm. Wednesday evenings from July 18, 2017 to August 22, 2018. 14. Free Summer Concerts at Brewer Plaza in Boston Common almost every weekday during lunchtime during the month of July and more dates too! 17. Free fitness classes, live music, children activities and more at Summertime at the Street in Chestnut Hill. Now until August 30, 2018. 18. Celebrate with one the largest Patriotic celebration in the nation with Boston Harborfest! June 28-July 4, 2018. 19. Cheer on the Patriots at Gillette Stadium for Patriots Training Camp for free for select dates this summer. Starting July 26, 2018. 20. Head to Boston Common for Shakespeare on the Common with Richard III by William Shakespeare. July 18-August 5, 2018! 23. Frog Pond Spray Pool Opening Day with food, games, and more! June 29, 2018. 26. Free Admission at Isabella Stewart Gardner Museum for Neighborhood Nights. Thursdays nights from 5-9pm on June 28, July 12 and August 9, 2018. 27. Kids Bowl Free all summer long at over 20 participating bowling alleys across Massachusetts!